Here in middle Tennessee we have had an unusually mild winter this year, and an even milder spring! I for one am not complaining! Warm weather along with the ability to be outside is my happy place! My kids, who are young adults now, will be the first to tell you that when the temperatures allowed, the windows were flung open and they were flung outside! Have you ever considered how God in His creation built all around us a natural playground? If you don’t teach kids fear of bugs, bugs become play pretties! Children generally are fascinated with bugs! If you don’t insist on them staying out of the dirt, they make modeling clay out of it, or it becomes some imaginary culinary delight! A tree with strong low hanging limbs attracts a child like a picnic attracts flies! And don’t you just love watching them under a weeping willow tree? What they inevitably do is grab the wiry limbs and start swinging! But the favorite natural play thing of all time is water!! What a great idea, God!! I always grin when seeing brief news clips of children frolicking in water fountains, regardless of where they are! 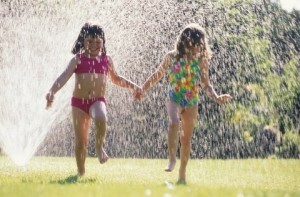 Pools, creeks, puddles, hoses or fountains, no matter the means of access kids will find their way to and delight in water! And honestly, don’t we grownups love it too! One of my favorite memories of my son Kaleb and his best bud Carson is when, in their effort to entertain themselves outside in the summer heat they decided to fill little buckets with water and bob for…. carrots! I obviously didn’t have any apples but the goal was to just make a game out of water! We easily think of water in its natural setting as calming, beautiful, even mood altering in the most beneficial way. But children see water and think “let’s play”! It makes me appreciate even more the intricate ways in which God has provided for us! Long before the convenience of component based playground “equipment” and beautifully structured in ground pools was the ease of just going outside and playing with all that God has blessed us with through His amazing creativity! So if your children are bored, and more importantly, if they are too content with indoor media entertainment, push them out the back door and… just add water! Love this post! So true!! Witt was riding his John Deere toy tractor through our sprinkler just the other day! It was not in my plan to have to shower and change his clothes, and I wanted to scold him! But, this is a great reminder that we can scold them into removing the creativity of creation from their hearts and minds. Thanks!